Yesterday evening I went to the airport to pick up my wife. She was returning from a visit with her mother in Washington State. Her flight was due in at 5:15 p.m., so I made sure to be there early. I wanted to greet her at the gate, not just pick her at the curb like she was a piece of luggage. Her flight was delayed. At 5:30 those of us waiting were told that her plane had arrived and was at the gate. I waited, and I waited. No one seemed to be getting off the plane. Just before 6:00 p.m. an ambulance arrived. Several medics with a stretcher, oxygen, etc. went down the hall in the direction of the gate escorted by security. As I continued to wait, I began to wonder, what happened? Did someone on the flight have a medical emergency? Was it my wife? I continued waiting. Finally, about ten minutes past the hour, the passengers began to appear. Yup, there she was, the love of my life. As we were going down the stairs to retrieve her suitcase, she explained what caused the delay. There was a family on board accompanied by four soldiers. They were bringing a soldier home from the war. Yes, there is a war going on. Soldiers on both sides, and many civilians—men, women, and children—are dying. The people onboard the plane were asked to remain seated until the family disembarked. It was a simple thing to do, a gesture of respect for the family and of course the soldier, also on the flight, but in the baggage compartment, in a coffin. The family and the honor guard stood on the tarmac as the coffin was taken off the plane. It was then that the soldier’s mother collapsed. Hearing that, it was easy for me to understand why the passengers were delayed in disembarking and why there was an additional delay for the luggage to be unloaded. While we waited at the luggage pickup, the four soldiers stood nearby with several family members. The soldiers were in dress blues, numerous ribbons on their breasts, yellow strips down the sides of their trousers, and of course, those silly looking berets our soldiers wear these days. While standing there waiting, I noticed one family member with the soldiers. She looked young, perhaps a sister of the fallen warrior. She stood there with her arms folded staring at the conveyer where luggage would soon begin to appear. Her head was bent slightly forward. The corners of her tightly closed mouth were turned down. I could tell she wanted to cry, but knew she must not. She had to remain stoic for the others. Emotionally, I began to feel as if I could sense her pain. I wondered what she was thinking. We celebrated Memorial Day only a week ago. The news media was full of scenes of parades and politicians laying wreaths and making speeches. I thought about writing something to mark the occasion, but simply could not do it. I have friends and family members who served in the military. 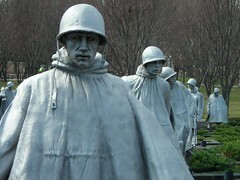 Some served in World War II, the Korean War, and the Vietnam War. I know others, some of them students of mine, who have served in Iraq and/or Afghanistan. I have a great deal of respect for them, because they did what they believed they should do. They were faithful to their convictions. When I think of war and all the suffering caused by wars, as I was forced to do yesterday evening, I have very mixed feelings. War is insane. To say that war is barbaric is too rational. Do civilized people commit acts of genocide, fire bomb cities, drop atomic bombs and napalm on innocent people? In every war the seeds of the next war are planted. Just in the past two days national news reported on massacres of civilians in Syria. Men, women, and children, some of them burned to death in their homes, all of them sacrifices to the gods of war. One news story told of how the suicide rate among our soldiers now exceeds more than one per day. More are taking their own lives than are being killed by enemy action. A friend of mine in graduate school served in Vietnam. He was a graduate of Virginia Military Institute. He was wounded just days before he was to return home, leaving him with a disability for the rest of his life. One afternoon he showed me some pictures of him in full dress uniform at VMI. Parading on the drill field, he said, was fun. Vietnam was different. That mother of the soldier who returned home yesterday evening will never get over the loss of her child. The wife will never really be able to forget her husband. Was the baby I saw in the arms of one of the family members the child of the fallen soldier? The soldier-son-husband-father will soon be “laid to rest” as they say. The honor guard will see that the funeral is dignified. I expect veterans will be present. They will play taps and even fire a few rifle shots over the grave. The flag will be taken off the casket, folded and given to the widow. Everyone will slowly walk away to continue living a life that will never be the same. Don’t give them any of that rubbish about how he died for his country, or how he gave his life in defense of freedom. Those are the lies that the makers of war tell the mourning. Enough of that! Wars have happened all through history, and they will no doubt continue to happen in the future. I am sorry, but I cannot make sense of them. Let’s cancel future Memorial Day holidays. After all, they are only excuses for a day off from the drudgery of everyday life, excuses for picnics and parties. The poet Carl Sandburg said: “Someday they’ll give a war and nobody will come.” He was wrong. There will always be those who for whatever reason will heed the call to arms, to rally around the flag, or to defend the fatherland. “War,” said Bertrand Russell, “seems a mere madness, a collective insanity.” Are we all insane? Until next time be good to call God’s creation and always walk under the mercy.